Acne is a skin problem that starts when dead skin and oil clogs the skin pores. This condition is most common among teenagers and young adults. Inadequate intake of water and infrequent washing of the face causes the development of pimples, as the toxins are not released from the body and thus get accumulated in the pores of the skin. Acne Gel consists of all the herbal ingredients which will wash away all the dirt and toxins plugged in the skin pores. Acne Gel consists of herbal ingredients like Tulasi leaves, which provide a glow on the face, and neem leaves with its anti-bacterial activity cleanse the skin. 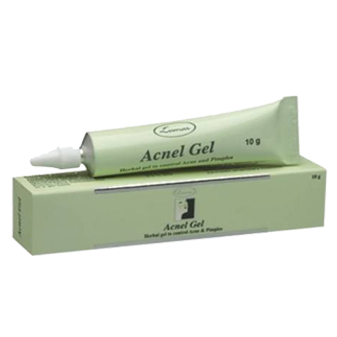 The gel relieves the skin from pimples and acne. Apply the balm and massage it gently on the affected area until completely absorbed. Repeat it 2 to 3 times daily.